Friday night: Late clearing. Breezy. Upper 30s. Saturday: Sunny. Low to mid 50s. Sunday: Quick shower, otherwise more PM sun. Mid 50s. It was a cloudy and damp end to the work week, but at least it was on the mild side, and that trend will continue into the weekend. 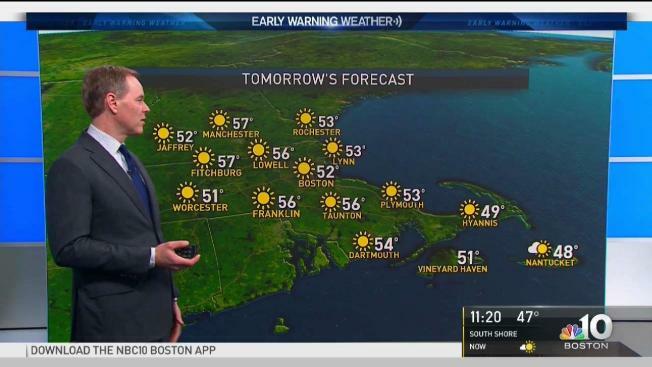 Boston and the surrounding area reached into the lower 60s for high temperatures Friday. The last time we've seen that warmth was Feb. 21, when we reached 72 degrees. Overnight, as the cold front that brought the afternoon and evening showers exits, some fog could develop along the Cape and Islands. Otherwise, expect a clearing of the skies after midnight with lows slipping into the 30s north, near 40 south and closest to the coastline. Out of the two weekend days, Saturday will be the pick of the weekend for any of your outdoor plans. We will start off bright and sunny before a few clouds stroll in by the afternoon. High temperatures will be slightly cooler than Friday, but we will still make it into the 50s south and mid-to-upper-40s north. For Easter Sunday, we'll have another cold front lurking to the northwest that sweeps in that could bring some spotty showers late morning into the early afternoon, with the colder air arriving, we could see a few snow showers for the mountains in the North Country. It will also be breezy as that front swings through, so hold onto your hats. The colder air settles in for the work week, with highs struggling to make it out of the 40s. Tuesday brings the next best chance for widespread showers, with a few mountain snow showers in northern New England. Lingering rain remains with us for Wednesday, but dries out just in time for the Red Sox home opener against the Tampa Bay Rays Thursday afternoon. The first full weekend of April could feature a few showers mixed with a few flurries early Saturday and late Sunday night, with highs also struggling to make it out of the 40s both weekend days. In the meantime, be sure to stay up to date on the latest forecast updates by downloading the NBC10 Boston and necn apps to get weather alerts on the go.